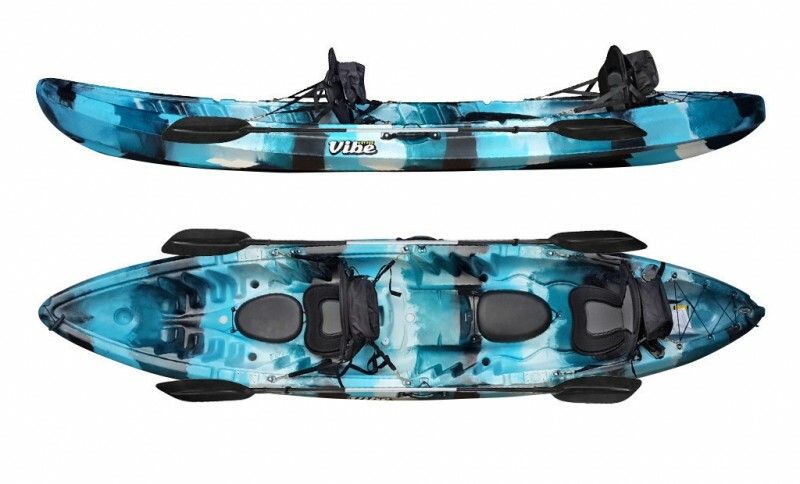 Vibe already has an impressive single person fishing kayak in the form of the compact Skipjack 90, but they haven’t forgotten about anglers who enjoy going out with company. With the Vibe Skipjack 120T, they have created a two person tandem fishing kayak that offers a lot of the same advantages as the Skipjack 90. At 12'2” it is obviously much longer than the Skipjack 90, but it is still 33” wide and with a weight of 72 pounds there should be no problem for two people to carry it. The Skipjack 120T has a capacity of 500 pounds, which is enough for two people and some gear. This kayak also has a center seat, which is great if you want to bring along a child for the ride, or if you want to do some solo paddling. It has a rotomolded single piece high density polyethylene construction and is available in “Sea Breeze,” “Hunter Camo” as well as “Blue Camo” colors. To make your time out on the water more comfortable the Skipjack 120 has two adjustable deluxe kayak seats and 2 built-in cup holders. 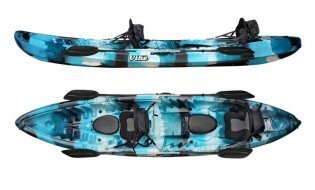 Since this is a kayak aimed at anglers, it also has 2 capped flush mount fishing rod holders, two side bungee paddle parks and two paddle rests. In addition, it has four mounting points where you can mount accessories by Scotty, Vibe, Railblaza or RAM. Cargo space is provided by two sealed hatches along with a rear tankwell that has adjustable bungee. The Skipkack 120 also has four scupper holes and comes with plugs for all of them. Since the Skipjack 120T is a tandem kayak, it obviously can’t offer the same type of performance as a more nimble solo fishing kayak. It tracks fairly well for its size and offers plenty of stability as well. While it won’t win any races, it does have more than enough storage space and plenty of comfort. It is also a pretty rugged kayak, so you won’t have to worry about it falling apart any time soon.